Let children’s interests drive reading choices. Create some some screen-free time–it makes a difference! You can also visit your school’s virtual library and gain access to audiobooks and ebooks through the BUSD Library Services webpage. Several other easy and fun learning ideas to keep young kids reading, writing, doing math, and interested in the sciences over the summer are found on this google document, as compiled by Thousand Oaks teacher Kathleen Marte. 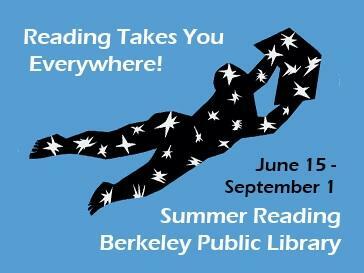 Berkeley Public Library Summer Reading — All Ages! Want to travel to faraway lands? Sail the Seven Seas? Jump into the future or take a trip into the past? Blast off to Pluto? Get a book, audiobook, or an e-book for a road trip? Or just dive deep into your own imagination? Explore somewhere you’ve always wanted to go? Reading takes you everywhere!